(Newser) – Decades after they were banned from the airwaves, Big Tobacco companies return to prime-time television next weekend—but not by choice. Under court order, the tobacco industry for the first time will be forced to advertise the deadly, addictive effects of smoking, more than 11 years after a judge ruled that the companies had misled the public about the dangers of cigarettes. But years of legal pushback by the industry over every detail means the ads will be less hard-hitting than what was proposed, the AP reports. Tobacco control experts say the campaign—built around network TV and newspapers—will not reach people when they are young and most likely to start smoking. "Their legal strategy is always obstruct, delay, create confusion, and buy more time," says Ruth Malone, of the University of California, San Francisco. "So by the time this was finally settled, newspapers have a much smaller readership, and nowadays, who watches network TV?" The new spots, which begin Sunday, lay out the toll of smoking in blunt text and voiceover statements: "More people die every year from smoking than from murder, AIDS, suicide, drugs, car crashes, and alcohol combined." The new ads are the result of a 1999 lawsuit filed by the Justice Department. 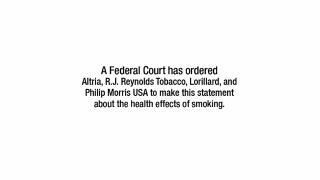 A federal judge ultimately sided with the government in 2006, ruling that Big Tobacco had "lied, misrepresented, and deceived the American public" about the effects of smoking for more than 50 years." Is this what YOU call Free Speech? The tobacco industry may rightly be compelled to warn its customers but this court ordered public humiliation of 'big tobacco' is troublesome in its moralizing. The principles of Freedom of Choice and Personal Responsibility are fundamental to what lifts America to Our position of enlightened humanity. Who among us is unaware of tobacco's perils other than those who by age or mental defect are so uncomprehending? Even the tired argument of the cost to the 'nation' of tobacco use fails when we understand that tobacco is the canary in the goldmine of Freedom. When GOVERNMENT can dictate Our vices we have lost Our Freedom. What is a life that has no bad decisions for the sake of pleasure? What is left to enjoy when we cannot take the risk to enjoy life's poison apples ? And what will be next? Sugar? Starch? Grains and meat? Roller skates and rock climbing? Do you have the new name for what was once known as America already picked out?